Draft: 2013, Cleveland Indians, 1st rd. 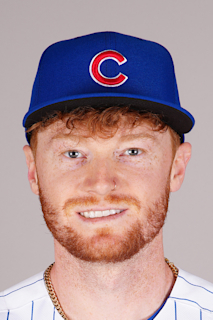 Full name is Clint Jackson Frazier…graduated in 2013 from Loganville H.S. (Ga.)…was named the 2013 Gatorade National Baseball Player of the Year after hitting .485/.561/1.134 with 56R, 17HR and 45RBI as a senior…earned 2012 All-America honors from Under Armour and AFLAC as a junior...Was the first high school position player chosen in the 2013 First-Year Player Draft…was the top-ranked player in the nation by Perfect Game USA and MaxPreps entering the draft...Was signed to play at the University of Georgia prior to signing with the Indians. Hit .265 (9-for-34) with 9R, 3 doubles and 1RBI in 15 games (7 starts in LF, one in CF and one at DH) over four stints with the Yankees (5/15-20, 6/4, 6/18-25 and 7/7-15)...Began the season on the 7-day concussion disabled list…in six rehab games (four with Single-A Tampa, two with Triple-A Scranton/Wilkes-Barre), combined to hit .217 (5-for-23) with 6R, 1 double, 2HR and 3RBI…was returned from rehab, reinstated from the concussion disabled list and optioned to Triple-A Scranton/WB on 5/2...Scored a run in each of his first seven games of the season (5/19-6/21), tied for the third-longest run-scoring streak to start a season by a Yankee since 1908: Babe Ruth (first 13G in 1931), Derek Jeter (first 8G in 1999), Bernie Williams (first 7G in 2003)…was tied for the Majors' longest season-opening runs streak since 2008 (Cincinnati's Shin-Soo Choo, first 7G in 2013; Toronto's Marco Scutaro, first 7G in 2009)…is the longest run-scored streak of his career...Hit safely in each of his first six games with an at-bat (5/19-6/21), a career-long stretch...Made his first career start in the leadoff spot in the starting lineup in 6/21 win vs. Seattle...Was again placed on the 7-day concussion disabled list on 7/16 and transferred to the 10-day D.L. on 7/25 (post-concussion migraines)…began a rehab assignment with Single-A Tampa on 8/30 and played in one game (1-for-3)…was transferred to the 60-day D.L. on 9/18 with post-concussion migraines, missing the remainder of the season...In 48 games with Scranton/WB, hit .311/.389/.574 (59-for-190) with 38R, 14 doubles, 3 triples, 10HR, 21RBI and 23BB...Played in just two spring training games…suffered a concussion on 2/24 at Pittsburgh. Hit .231 (31-for-134) with 16R, 9 doubles, 4 triples, 4HR and 17RBI in 39 games (27 starts in LF, 6 in RF and 2 at DH) with the Yankees…of his 31H, 17 went for extra bases (54.8%)... His ﬁrst 4H were a double, HR, triple and single, becoming the second Yankee to hit for the cycle in his ﬁrst 4H (also RHP Johnny Allen in 1932, who went 17-3 with a 3.70 ERA in his rookie season as the Yankees swept the Cubs in the World Series) and the ﬁrst Major Leaguer to do so since Atlanta's Tyler Pastornicky in 2012-credit: Elias...Of his ﬁrst 7H, six went for extra-bases (1 double, 2 triples, 3HR)…is the fourth Yankee ever to hit at least 3HR within his ﬁrst seven Major League games, joining Jesús Montero in 2011 (3HR), Shelley Duncan in 2007 (4HR) and Steve Whitaker in 1966 (3HR)…only two players under age-23 hit more HR in their ﬁrst seven Major League games (Los Angeles-NL's Yasiel Puig-2013, St. Louis' Joe Cunningham-1954, 4HR each)... Had 11 extra-base hits (6 doubles, 2 triples and 3HR) through his ﬁrst 16 career games (7/1-23)…according to Elias, the only other player in Yankees history with at least 11 XBH through 16G is Joe DiMaggio (13)…had 14 extra-base hits (7 doubles, 3 triples, 4HR) through his ﬁrst 25 games (7/1-8/3)…only three other players in Yankees history tallied as many as 14XBH through 25 career games: DiMaggio (22), Gary Sánchez (19) and Shane Spencer (14)... Had 16RBI through his ﬁrst 20G (7/1-28), becoming the ﬁfth Yankee in franchise history to accomplish the feat according to the YES Network (Hideki Matsui-20RBI, Joe DiMaggio-17, George Selkirk-17 and Mickey Mantle-16)... Made his Major League debut in 7/1 loss at Houston, hitting his ﬁrst career home run (oﬀ Tony Sipp) in the seventh inning…started in RF and and was 2-for-4 with 2R and 1 double…became the 12th Yankee to homer in his Major League debut and ﬁrst since Tyler Austin and Aaron Judge went back-to-back on 8/13/16 vs. Toronto…his sixth-inning double oﬀ Francis Martes was his ﬁrst Major League hit…according to Elias, became the third Yankee ever to collect multiple extra-base hits in his Major League debut (also Dixie Walker in 1931: 2 doubles in a 14-inning game and Mike Pagliarulo in 1984: 2 doubles) and the ﬁrst to do so while hitting a home run…signed to a Major League contract and selected to the Yankees' 25-man roster from Triple-A Scranton/Wilkes-Barre prior to the game... Hit ninth-inning "walk-oﬀ" three-run HR and was 3-for-4 with 1 triple and 4RBI in 7/8 win vs Milwaukee (his sixth career game)…at 22 years, 305 days old, was the youngest Yankee to hit a "walk-oﬀ" HR since Melky Cabrera (21y, 341d) on 7/18/06 vs. Seattle and the youngest Yankee ever with a "walk-oﬀ" HR when the team was trailing... was his second career HR, making him the ﬁfth Yankee to hit a "walk-oﬀ" HR within his ﬁrst 2HR: Alfonso Soriano (1st HR on 9/24/99 vs. Tampa Bay) Mike Hegan (1st HR on 9/1/67 vs. Washington-AL), Bob Grim (2nd HR on 9/5/57 vs. Boston) and Frank LaPorte (2nd HR on 5/3/1906 vs. Philadelphia-AL)…became the third Yankee with a "walk-oﬀ" HR within his ﬁrst 10 Major League games - Phil Rizzuto (10th career game, 4/23/41 vs. Boston, two-run HR in the 11th oﬀ starter Charlie Wagner) and Alfonso Soriano (sixth career game, 9/24/99 vs. Tampa Bay, solo HR in the 11th oﬀ Norm Charlton)-credit:Elias...was the ﬁrst Yankee with a triple and a "walk-oﬀ" HR in the same game since Babe Ruth on 8/18/1922... Started in LF with Todd Frazier starting at 3B in 7/21 win at Seattle…it marked the ﬁrst time the Yankees had two ﬁelders with the same last name in the starting lineup since 9/19/08 vs. Baltimore, when 3B Alex Rodriguez and C Iván Rodríguez started in the ﬁrst game of the ﬁnal series at the original Yankee Stadium... Was placed on the 10-day disabled list from 8/10 (retroactive to 8/9) - 9/11 with a left oblique strain…missed 31 team games…played in four postseason rehab games with Double-A Trenton (2-for-17, 1R, 2RBI)... Was on the Yankees' Wild Card Game roster, but did not play…was not on the roster for the ALDS or ALCS... In 74 games with the RailRiders, hit .256/.344/.473 (70-for-273) with 46R, 19 doubles, 12HR, 42RBI and 9SB. In 133 games at Single-A Lynchburg, hit .285/.377/.465 (143-for-501) with 88R, 36 doubles, 3 triples, 16HR, 72RBI, 68BB and 15SB…led the Carolina League in hits, doubles, extra-base hits (55) and total bases (233) and placed among league leaders in home runs (second), runs scored (second), RBI (third), walks (third), OPS (third, .842), BA (fourth), OBP (fourth) and slugging pct. (fourth)…ranked among Indians organizational leaders in runs scored (ﬁrst), hits (second) and RBI (fourth)…was named a CL Postseason All-Star and MiLB.com Organization All-Star... Earned MiLB.com CL "Player of the Month" honors in July (.363, 37-for-102, 21R, 7 doubles, 3HR, 17RBI, 6SB in 28G)... After the season, played for the Scottsdale Scorpions of the Arizona Fall League and hit .281/.347/.438 (25-for-89) with 15R, 1 double, 3HR, 8RBI and 4SB in 22G…was named to the AFL Rising Stars Game and the AFL All-Prospect Team... Following the season, was ranked by Baseball America as the No. 44 overall prospect and No. 2 prospect in the Indians organization…was tabbed by Baseball America as the No. 5 prospect in the Carolina League. Spent the season with Single-A Lake County and hit .266/.349/.411 (126-for-474) with 70R, 18 doubles, 6 triples, 13HR, 50RBI, 56BB and 12SB in 120 games... Following the season, was ranked by Baseball America as the No. 3 prospect in the Indians organization and the No. 9 prospect in the Midwest League. Made his professional debut with the AZL Indians, batting .297 (51-for-172) with 32R, 11 doubles, 5 triples, 5HR and 28RBI in 44 games…was an Arizona League Postseason All-Star... Was tabbed by Baseball America as the No. 1 prospect in the Arizona League…following the season, was ranked by the same publication as the No. 48 overall prospect and No. 2 prospect in the Indians organization. April 1, 2019 New York Yankees recalled LF Clint Frazier from Scranton/Wilkes-Barre RailRiders. March 22, 2019 New York Yankees optioned LF Clint Frazier to Scranton/Wilkes-Barre RailRiders. November 1, 2018 Clint Frazier roster status changed by New York Yankees. August 30, 2018 New York Yankees sent OF Clint Frazier on a rehab assignment to Tampa Tarpons. August 12, 2018 New York Yankees sent LF Clint Frazier on a rehab assignment to Tampa Tarpons. July 7, 2018 New York Yankees recalled LF Clint Frazier from Scranton/Wilkes-Barre RailRiders. June 25, 2018 New York Yankees optioned LF Clint Frazier to Scranton/Wilkes-Barre RailRiders. June 18, 2018 New York Yankees recalled Clint Frazier from Scranton/Wilkes-Barre RailRiders. June 5, 2018 New York Yankees optioned LF Clint Frazier to Scranton/Wilkes-Barre RailRiders. June 4, 2018 New York Yankees recalled Clint Frazier from Scranton/Wilkes-Barre RailRiders. May 20, 2018 New York Yankees optioned LF Clint Frazier to Scranton/Wilkes-Barre RailRiders. May 15, 2018 New York Yankees recalled Clint Frazier from Scranton/Wilkes-Barre RailRiders. May 2, 2018 New York Yankees optioned LF Clint Frazier to Scranton/Wilkes-Barre RailRiders. May 2, 2018 New York Yankees reassigned LF Clint Frazier to the minor leagues. May 1, 2018 New York Yankees sent OF Clint Frazier on a rehab assignment to Scranton/Wilkes-Barre RailRiders. April 26, 2018 New York Yankees sent LF Clint Frazier on a rehab assignment to Tampa Tarpons. March 29, 2018 New York Yankees placed LF Clint Frazier on the 7-day disabled list retroactive to March 26, 2018. Concussion. October 22, 2017 New York Yankees activated LF Clint Frazier. October 5, 2017 New York Yankees reassigned LF Clint Frazier to the minor leagues. September 11, 2017 New York Yankees reassigned LF Clint Frazier to the minor leagues. September 6, 2017 New York Yankees sent OF Clint Frazier on a rehab assignment to Trenton Thunder. August 10, 2017 New York Yankees placed LF Clint Frazier on the 10-day disabled list retroactive to August 9, 2017. Left oblique strain. July 1, 2017 New York Yankees selected the contract of LF Clint Frazier from Scranton/Wilkes-Barre RailRiders. January 31, 2017 New York Yankees invited non-roster CF Clint Frazier to spring training. September 5, 2016 Scranton/Wilkes-Barre RailRiders activated LF Clint Frazier from the 7-day disabled list. August 28, 2016 Scranton/Wilkes-Barre RailRiders placed LF Clint Frazier on the 7-day disabled list. August 1, 2016 LF Clint Frazier assigned to Scranton/Wilkes-Barre RailRiders. July 25, 2016 CF Clint Frazier assigned to Columbus Clippers from Akron RubberDucks. May 31, 2016 Akron RubberDucks activated CF Clint Frazier from the 7-day disabled list. May 25, 2016 Akron RubberDucks placed CF Clint Frazier on the 7-day disabled list retroactive to May 24, 2016. April 5, 2016 CF Clint Frazier assigned to Akron RubberDucks from Lynchburg Hillcats. March 13, 2016 OF Clint Frazier assigned to Cleveland Indians. April 5, 2015 CF Clint Frazier assigned to Lynchburg Hillcats from Lake County Captains. March 13, 2015 OF Clint Frazier assigned to Cleveland Indians. April 17, 2014 CF Clint Frazier assigned to Lake County Captains from AZL Indians. June 16, 2013 CF Clint Frazier assigned to AZL Indians. June 15, 2013 Cleveland Indians signed OF Clint Frazier.